· Free experimentation environment: CloudLab. As part of Sofia2’s offering,an experimentation environment is provided, where the platform developers can try out all Sofia2 capabilities at no cost. This way, any user can start extracting value from the Platform. The whole platform is managed, maintained and run via a web console, including entities definition (ontologies) to security, clients creation, rules, etc. In addition, REST APIs are offered for this management, allowing the integration of this management in other administration consoles. A light semantic approach is proposed, based on JSON which is appropriate for every kind of devices, even the most limited. Premade models exist for several domains, such as the Smart City domain, Smart Energy, etc. These models are expandable. From the web console users can create entities under the domains created. The messages exchanged between the clients and the Platform are independent from the Platform. 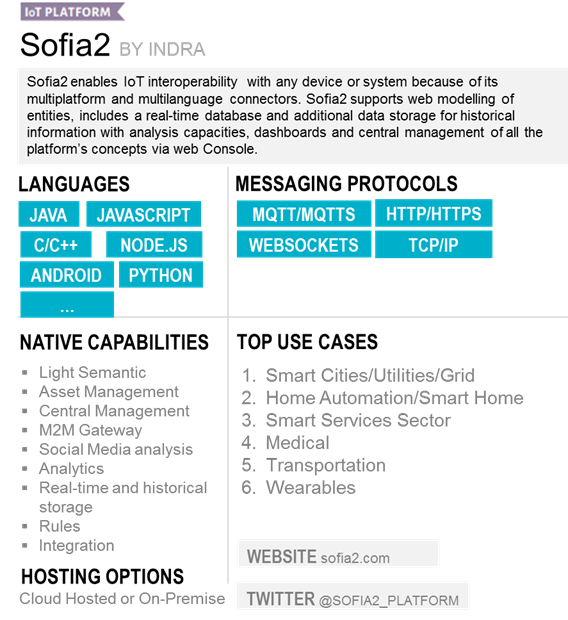 Sofia2 provides out-of-the-box connectors for MQTT, REST, WebSockets, WebServices and JMS. Developers can create new pluggable connectors. The Platform is designed to be extended in projects via the plugin concept. Plugins are deployed like JARS and allow the creation of new connectors, the definition of the appropriate security model, etc. The installation can be customized attending to different requirements: installing only required modules, definining module parameterization, etc. In Sofia2, security is regarded as crucial. Security is offered at the communication layer (HTTPS, MQTTS…) and also different permissions can be set to entities, which can be configured as private, public or custom access. Besides the REST connector, which can be easily used from any language, Sofia2 offers multilanguage APIs when more advance, complex and efficient protocols are required. All the APIs are provided under the Apache license and no cost. APIs working as integration mechanisms are now a reality, as demonstrated by large companies like Facebook, Twitter, Google or International Banks. Sofia2 integrated API Manager publishes entities (ontologies) across REST APIs. This feature allows complements the Open Data concept with the dynamism of REST APIs. The API Manager also publishes external APIs using a RESTful approach, unifying the access to them. The platform has a Rules engine that provides an easy way to define rules from web console. These rules can be triggered on the reception of specific data, events or by time. This feature allows authorized users to create new reusable rules using scripting language, which can then be invoked by the engine (e.g. to send SMS or emails). Also, there is a CEP engine to define rules which include time variables (i.e. a measure has not arrived in the last day). Users can subscribe to the events generated by the CEP engine, or use it as an input for the Rules Engine. Sofia2 console provides an interface for searching (profiles, timelines, groups, hashtags, trends) across the main social networks. These searches are persistent and therefore can be used in analytical processes. The Platform’s RI is based on open source software without any restrictions. Thanks to this feature there are no expensive license costs involved during the installation process. The platform can be installed On-Premise and On-Cloud, either public or private. Support for a wide variety of operation models and different kind of support depending on organization needs. The cloud platform offers a PaaS model (cost depends on infrastructure deployed) or a SaaS model (costs depending of amount of messages processed or TB used). The Platform natively integrates a Big Data approach, so each entity (ontology) has its own configuration defining the moment when data will be transferred from the RTDB (Real Time Database) to the HDB (Historical Database) (RI based on Hadoop). The platform includes features that allow users to launch online requests/queries to the RDTB or the HDB. The platform provides an integrated and easy way to perform analytical processes over the HDB.